In preparation for the first-ever ASEAN Electric Vehicle Summit to be held in Manila this year, the Electric Vehicle Association of the Philippines sent a representative to Vietnam to study EV applications in a country with driving terrains and conditions similar to those in the Philippines. After a recent visit to Hanoi, Vietnam, the EVAP observation report noted many similarities to and contrasts with the Philippines. EVAP Executive Director Bong Cruz says that of course, the Vietnamese have the same Asian warmth as the Filipinos that is common in tropical countries. “It must be the weather. A warm sunny weather will always put one in a good, comfortable mood. The perfect setting when one wants to get away from the hustle and bustle of the jungle city”. However in terms of tourism development, the report cited that Hanoi is quite ahead of the Philippines. Juan explains that Hanoi has an old quarter that is the old Hanoi development area and a modernistic French quarter which the French built during their near 70-year occupation of Vietnam. Both quarters are rich in history and culture which the tourists gobble up in spades. Cruz adds that even in tourism transport, Hanoi has more mini tourist buses which can bring tourists around the famous tourism sites. “The traffic is manageable within the city and is delightfully free in the outskirts going to other areas such as the world heritage site, Halong Bay”. But what is very noticeable in Hanoi is the proliferation of electric vehicle shuttles within the tourist areas such as around the Old quarter, the French quarter and the famous Hoan Kiem Lake , he adds. The electric vehicles are actually the big 6-seater golf cart varieties which are smaller yet very similar to the 14 seater electric jeepneys now plying in Makati, Filinvest City Alabang, Muntinlupa and Ateneo. Cruz adds that it makes sense as it is more enjoyable for the tourists since it is open on the side so visibility is greater and a tourist can absorb more of the scenery, is quiet so one can hear the tour guide more clearly and is smoke-free so it is more convenient for tourists as they do not have to inhale the pesky engine smoke. The EVAP report suggests that maybe the Philippines should have more EJeepneys for tourism application. The report however cites one thing that the Philippines has that Vietnam does not have and these are the electric tricycles. Juan reveals that ETrikes are more practical especially for those travelling in groups of five or less, which incidentally is the average size of a Filipino family. Thus here in the Philippines, ETrikes have started penetrating famous tourist areas such as Coron, Boracay, Puerto Princesa and Intramuros. The EVAP report sees this as a good sign, but recommends that perhaps EJeepneys should also be introduced in these sites to cater to the bigger groups. Cruz concludes by saying that EVAP has made it as its advocacy to promote the use of electric vehicles in the Philippines. “We are now encouraging tourism industry players to help develop green tourism in the Philippines. 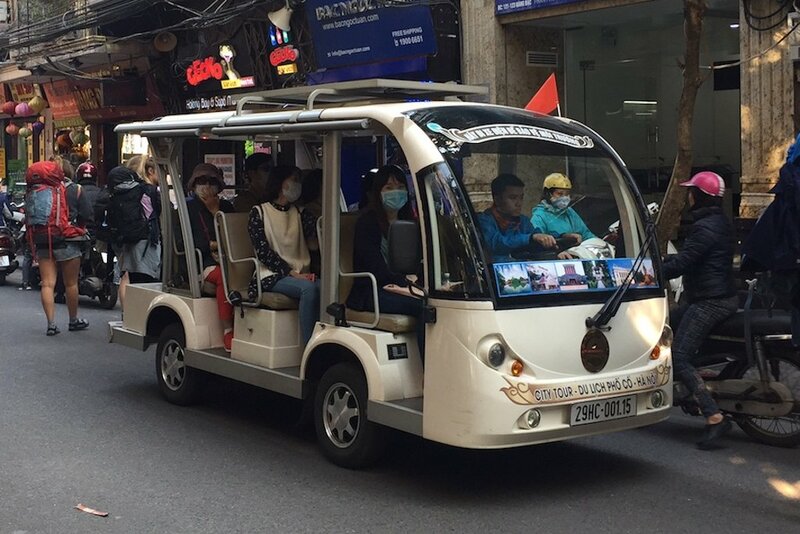 I believe this is one lesson we can learn from the Vietnamese: provide tourists with shuttle vehicles that are quiet, comfortable and smoke-free. This will be good for everyone in the tourism industry”.